In Eugene Walter’s book, The Untidy Pilgrim, he writes, “Down in Mobile, they’re all crazy, because the Gulf Coast is the kingdom of monkeys, the land of clowns, ghosts and musicians, and Mobile is sweet lunacy’s county seat.” Anyone who has spent time in Mobile would agree. The original capital of French Louisiana, Mobile claims the title as the birthplace of Mardi Gras. With architecture inspired by both the French and Spanish, downtown Mobile has a European feel. It also holds the title for the rainiest city in America; it's a place where schools get hurricane days instead of snow days. In the summer the heat and humidity blankets the air. Within the confines of my childhood everyone appeared to be black or white, Southern or not. Those who came from elsewhere, who had accents unlike my own, seemed foreign and exotic. Going away for camp as a middle school student gave me an opportunity to see how the rest of the country viewed the South; it was eye-opening. I never thought about my Southern identity until I moved away. Then I became both a critic and an ally. 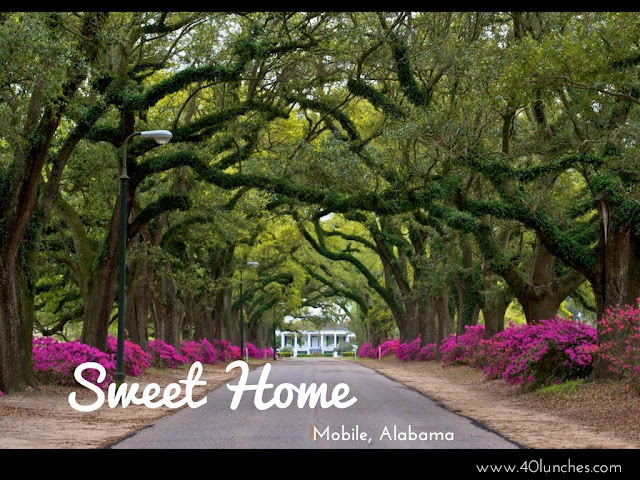 I grew up in West Mobile dividing my time between the house my mother grew up in and the house my father's childhood home. My father’s house sat on a large piece of land where my cousins and I would climb trees, ride motorcycles, pick pecans, and build forts. It was the sort of slow-living childhood that many today long for. But it was my mother’s house that felt like home. Overlooking a lake, the modest cottage was built by my grandparents in the 1950’s. When my mom and I moved off of our 38 foot houseboat when I was in the second grade, my grandmother gave us the house. There was a playhouse, complete with a fireplace, that my grandfather built for my mother. I spent hours down there playing and listening to music on my mother's old turntable. Throughout my childhood and until my mother’s death, the little lake house remained a constant. No matter how chaotic my life was, the house represented stability. It became my sanctuary, a place to escape when I needed refuge from the world. The city has changed since I left in the 90’s. Downtown Mobile has seen a revitalization after white flight left the area empty and devastated. Now restaurants line Dauphin Street where, if you try, you might imagine you’re in New Orleans. Going back now I see the city becoming more diverse, which is reflected in the restaurants. Largely populated by chains when I was growing up, you can now find authentic Vietnamese, Middle Eastern, and Indian food mixed in among the seafood and barbeque restaurants. Each area in town has a distinctive flavor. When I was little I loved driving around the Oakleigh Garden District looking at the historic homes. They all seemed so grand and larger than life from a child’s point of view. An eclectic mix of old Mobile society, artists, and families, the Oakleigh Garden District had character. When my mom died, the little house on the lake was no longer my home, so I bought a house in Oakleigh, right on Washington Square; it’s a house I have loved since I was a child. I bought a couch and a bed, and with a friend’s borrowed lawn furniture in the dining room, I set out to transform the house into a home. With a little Christmas tree set up in the corner, my grandmother and I celebrated our first Christmas without my mom. It is there that I fell in love with my husband, got married, and decorated the nursery for our daughter. Oakleigh is the kind of neighborhood where people host porch parties in the summer, deliver meals when someone dies or is born, and families go for walks after dinner. A diverse neighborhood, I can hear church bells ring at the Episcopal church and the call to prayer from our local mosque from my house. There is Callaghan’s Irish Social Club, with their award-winning hamburgers and live music, and the local coffee shop, which each serve as the unofficial community centers for the neighborhood. I still own the house, but now someone else lives there. I drive by each time I’m in town. After my mother died, my grandmother gave me reason to return. As she grows increasingly frail, I can’t help but wonder what will bring me back when she is gone. We have friends and family in the area, so I know Mobile will always be a part of our lives, but I doubt it will ever be the same. But for now I continue to hold on to the little blue house on the square and find comfort in knowing that no matter what happens, we have a place to go home to. Have you enjoyed this post? Please share it on Facebook or Twitter.